Citrus and Herb Oven Poached Salmon Recipe. A simple flavor packed dish on the table in under 30 minutes! Made in Partnership with Pacific Foods. Is Spring ever coming? At this point, I am seriously doubting it. It’s been so cold, so rainy and so gloomy here in Seattle. There were a handful of sunny afternoons this past month but they were seriously few and far between. Can you tell I am over it? Last weekend, we had friends visiting from Philadelphia (YAY!) and had a dinner party at our house to welcome them to Seattle. Since Seattle is synonymous with Alaskan Salmon, we obviously had to make sure a good salmon dish was on the menu. I have been playing around with Oven Poached Salmon techniques and exploring some new flavor combos to really infuse the salmon with a blast of flavor and this is the dish I served last week. The salmon was so tender, the flavor was delicate and bold at the same time and everyone loved it – adults and kids alike! So, I obviously had to recreate it, take pictures and make sure to share with you guys STAT. I am not-so-secretly hoping that the bright lemon and orange slices are a beckoning call to Spring and to the Sun. Hopefully, they will arrive soon and stay for a while. If not, at least we can keep making this bright dish and pretend. If you want to keep this dish free from chicken, I recommend subbing Pacific Foods Organic Simply Stock Vegetable Unsalted as this works best with an unsalted broth. While the salmon is best served warm, it can be cooled and served chilled over a salad or chilled completely and frozen in individual portions for later. If you don’t usually keep whole cardamom pods and dried whole star anise in your spice cabinet, you can just buy what you need for this recipe in bulk to save money. Slice lemon and orange and trim ends of scallions. Gather spices, herbs and broth. Place whole salmon filet, skin side down, into roasting pan or other large pan (with high sides) that can accommodate the length of it. Layer lemon and orange slices onto salmon. Add dried spices, fresh herbs and trimmed scallions to pan alongside salmon. Add broth until salmon is just covered (by about 1/4"). I used 6 cups but you may need a little more or a little less depending on the thickness of the fish. Carefully place roasting pan into a cold oven (do NOT preheat) on the middle rack. Set the oven to 350F and set a timer for 20 to 22 minutes. You may need to adjust your cooking time depending on the thickness of the fish. Remove from oven and very carefully remove salmon filet to a cutting board. Slice into 6 or 8 pieces and serve with 1 to 2 Tablespoons of cooking liquid spooned over each piece. Enjoy! DISCLOSURE: This post is part of a series of posts sponsored by Pacific Foods. Pacific Foods has compensated me for my time to develop this recipe as their 2017 Brand Ambassador for Broths. Thank you for supporting the brands that make EverydayMaven possible. All opinions are my own. These citrus and herb oven poached salmon just looks so incredibly delicious and I am so craving a slice right now! Can I post it on my blog? Hi, Alyssa! I am really obsessed with citrus and herb oven poached salmon recipe! Thx for sharing healthy recipe! Yay! That is so wonderful to hear – glad you love it Jill! 2. I’m planning to chill it. I don’t see instructions on doing so. Once it is cooked, what steps do you recommend to chill it? Do you leave it in the cooking liquid? Or remove it and chill it separately from the cooking liquid? To chill, I would recommend removing the cooked salmon from the liquid and chilling them separately. Enjoy! Hope you love it Heather! I hope you love it Colleen! I always need at least 2 cartons of broth in my pantry to feel well stocked. I use it all the time! We always broil our salmon, so I want to try it poached next. This is truly stunning. I love salmon and this recipe is outstanding. Do they sell Pacific broths in Canada? Hi Kim! I am 90% sure that they have distribution in Canada. Do you live near a Whole Foods? I was just chatting about bone broth with my cousin!! This looks amazing! Thanks Liz! Bone broth is seriously the best! I don’t feel like spring is ever going to get here. It was -9 when I got up this morning and last night when we took the dogs out the wind was burning my throat! I’m ready for warm weather!!! Until then, I’ll be making this citrus salmon and dreaming of spring! Holy crap Angie! -9 is insane!! We’ve had really weird weather this winter. Almost no snow, and most of January and February were quite warm (for the season). Even wore shorts a few times! Then this week quite cold — it’s 17 degrees as I write this! Yelp! Anyway, it’ll soon be wild salmon season, and I can’t wait. This looks terrific — such a nice recipe. Thanks! The weather here has been funky as well John! I’m totally going to need to find this Bone Broth! Delicious! Yes! It is my go-to if I don’t have homemade. Excellent quality and a great base since there is no added salt. This is the kind of dinner I want at least once a week! 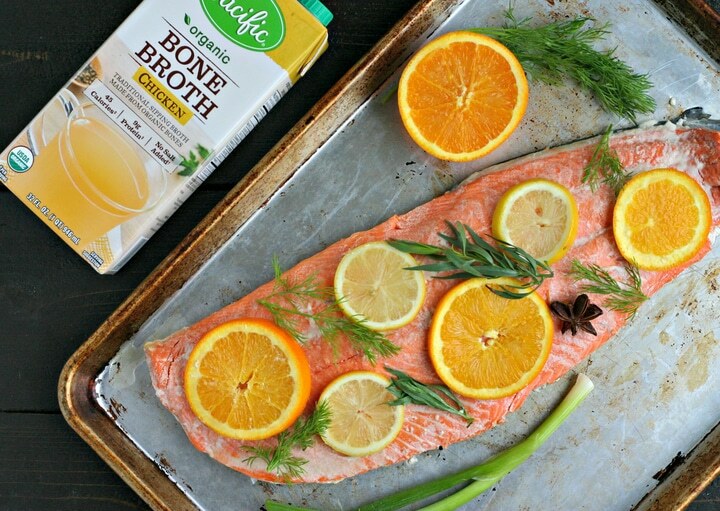 Your salmon looks delicious and I have to keep an eye out for their bone broths…so many things you can make with them!! Right? I could easily eat this every week! Yeah spring is never coming! We are getting another huge snow storm today and tomorrow. Love this way to cook salmon! Maybe it worked Ashley – today was MAGNIFICENT! Oooh, there is nothing better than wild salmon! Love the pairing here with citrus and fresh herbs, and cardamom is such an inspired addition! Thanks Faith – it was so flavorful! HUUUUUUGE fan of both Pacific Foods Bone Broth and ANYTHING salmon. Loving that citrus addition too! Hello dinner! You have to try this Taylor – it’s soooo good! LOVE this Citrus and Herb Oven Poached Salmon and Pacific Foods! This recipe looks so good and not that time intensive to make. Fresh, wild caught salmon is hard to come by in Chicago unless you are willing to pay a steep price. But Trader Joe’s has some decently-priced wild caught salmon that is frozen, so I will have to try this recipe next time I pick some up! Thanks. Frozen wild caught salmon will be perfect Kevin! This looks like a totally foolproof way to cook salmon! I cannot wait to get my hands on some of that Pacific Foods Bone Broth to use for the job! Your recipe looks like it will be spectacular. I’m going to make it this week with arctic char. I’m looking for suggestions on what to do with the leftover poaching liquid. Is it suitable for a soup? Base for a mussel steaming liquid? I would hate to dump those lovely ingredients down the sink. What did you do with it? Hi Steve! Thank you so much – I hope you love it! The liquid would be FABULOUS for mussels, clams or a quick fish soup or stew. I have used it as a sauce by reducing some over low heat and then thickening with an arrowroot:water mixture and spooning over the salmon when served. I also froze some for fish stew and I froze some of the broth for future salmon poaching liquid (I should also clarify that I’ve made this dish multiple times so that is not all from one batch) I can’t wait to hear what you do with it! I’m amazed at your innovation. This recipe is genius!! I have made it 3 nights this week. First night Arctic Char with quinoa pilaf; second night char, gulf shrimp and veg stirfry zuchinni spiralini; third night gulf shrimp poached and grilled prime rib with traditional (baked potato etc.). This recipe is genius (wait, I already said that, darnit!!). I love your base recipe and I expect it will be riffed on at my house for weeks – no end in sight. Hi Steve! What great feedback – thanks for taking the time to let me know and I love how many ways you are utilizing this recipe!! I’m a Philly girl and have been trying many of your recipes and am delighted with most of them. The one above for poached salmon sounding interesting but I’m only cooking for 2 and decided to cut the recipe. However I’m not familiar with star anise. Are you referring to the fruit not the powder. Would I use a whole one? Could you clue me into star anise? Hope you enjoyed your company. Hi Marion! Thanks so much 🙂 For this recipe, you need 1 whole dried star anise. I just updated the recipe so it’s more clear. You can get 1 in the bulk spices section. Since you can’t cut it in half, just look for a smaller one and it should work out fine! Have a great Sunday! !